Solid pine and forged iron. Measures: H 78 cm/ 30 3/4" W 71 cm/ 28" D 67 cm/ 26 1/2" Seat height 33.5 cm/ 13 1/4". Sofa attributed to Axel Larsson for Gemla, Sweden, 1950s. Stained birch and hemp webbing. Lacquered oak and stainless steel. Armchair designed by Ib Kofod-Larsen for Christensen & Larsen, Denmark, 1950s. Teak, oak and leather. Armchair in solid pine and black wrought iron, attributed to Axel-Einar Hjorth for Åby Furniture, Sweden, 1950s. 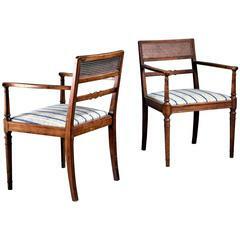 A pair of armchairs attributed to Axel Einar Hjorth for Åby Furniture, Sweden, 1950s. In pine and cast iron. Made in birch and brown red leather. 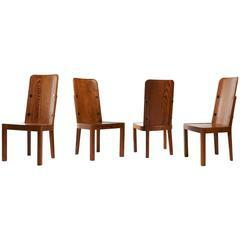 A rare set of dining chairs by Axel Einar Hjorth. Tall smooth backs with large black iron nails. Oregon pine with lovely grain and matte finish. Newly restored.